Being an avid reader with thousands of books filling up shelves in my home, I’m all in favor of e-books. I decided to browse among the aisles and shelves of the iBookstore, and see how it works. Having been a bookseller for three years and being a regular customer of Amazon.com and other online book vendors, I had a number of expectations. I was also curious to see how Apple approached selling this new type of content. As I mentioned above, you can only buy books through the iBooks app on the iPad. While Apple has announced that this app will be available for the iPhone and iPod touch, the company hasn’t indicated whether iBooks has a future on the Mac. The e-reader could fit into a future update of iTunes or even appear as a standalone app, but that’s entirely in the realm of speculation. 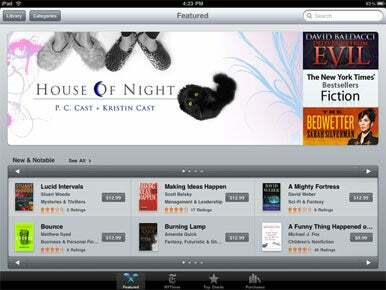 Here’s what you see when you enter the iBookstore by tapping on iBooks’ Store button. In the here and now, when you launch iBooks on your iPad and tap on the Store button, you see a display that’s similar to the iTunes Store main page, but scaled to Apple’s tablet. Rotating banners at the top of the page greet you, while a New & Notable section displays a mere six titles and four promotional bricks line the bottom of the screen. You can tap the arrows in the New & Notable section to pan through four screens, and if you realize that you can scroll down on this page—no scroll-bars are visible, so it looks like the page stops below the bricks—you’ll see another section with six books and three or four screens, usually dedicated to a specific author or subject. When I visit a bookstore, I want to see more than a few dozen books. And you can on the iBookstore. You can actually see several hundred books. There are 21 “categories”—Apple’s term for genre—available from the Categories button at the top of the iBookstore window. You can jump from Arts & Entertainment to Parenting to Sports & Outdoors, by way of Fiction & Literature, Sci-Fi & Fantasy and Romance. But that still doesn’t offer that many books, since no reader is interested in all those categories. You can search, of course, by entering a title or author’s name in the search field, but you need to know what you want. The number of books you can see at any one time is limited. If you want to find out more about a book, tap its icon—a pop-up window shows you some information. Depending on the book, you’ll see its publication date, category, print length (the number of pages in the paper version), a description, and ratings and reviews. Not all books have descriptions, though you can download a free sample of any book: just tap Get Sample, and you’ll get a file with one or several chapters to check out. This is useful to read a few pages of the book, check out its table of contents, and see how it looks on the iPad. Samples have Buy buttons at the top of their pages, so you can purchase a book without having to find it in the iBookstore again. When you tap on a book to get more info, this is what you see. Many books don’t contain information about print length. 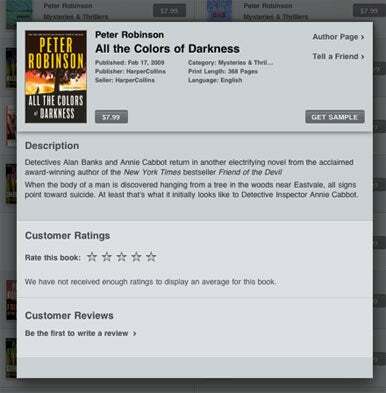 I’d like to see iBookstore display more info about books. Too many offerings have no description, many don’t give any idea of their length—the “print length” entry is often MIA—and there are no related books displayed, whether from the same author or just related titles. Also, Apple’s use of categories is odd. For example, The Lord of the Rings is listed as part of the “Epic” category—but “Epic” does not appear in the category list. A history book I looked at is in the “Military” category, and some mysteries were listed as “Fiction & Literature.” Better categorization is in order here. The iBookstore lets you view its own best-seller lists for each category (in iBooks, tap Top Charts at the bottom of the window, then choose a category at the top) as well as New York Times best-seller lists. There are even free book lists on the iBookstore in most categories (though oddly not the Classics category, where many books in the public domain are available). There are plenty of free books for download, from public-domain books sourced from Project Gutenberg to other free books by authors looking for exposure, or just willing to give their books away. You could fill up your iPad without spending a penny. 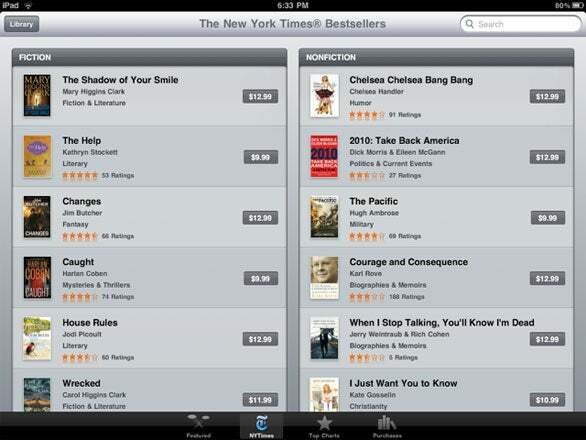 Check out books on the New York Times best-seller list—at least those available in e-book format from the iBookstore. What I’ve found most useful, as both a bookseller and buyer, is serendipity—the ability to come across a book you’ve never heard of because it’s on the same table or in the same shelf in a brick-and-mortar bookstore, or on the same page on Amazon.com. The iBookstore fails in this respect. Aside from the books you see on the main page of each category, there are no links to other titles. Contrast this with Amazon, which has this aspect of book-shopping down pat. You’ll find “Customers Who Bought This Item Also Bought” lists on the Amazon.com pages for each book; these provide suggestions for dozens of other books that may interest you if you thought about buying the book on the page. Browse for a book at Amazon.com, and the Website will give you recommendations of other books you might be interested in. Apple’s iBookstore doesn’t offer that service. This is the initial version of the iBookstore, and Apple will hopefully figure out how to get it right. (And in fairness to the company, it’s hard to implement a “Readers Also Bought” feature when you’ve got only a month’s worth of sales data to build off of.) What’s missing at this point is consistent metadata about books, and especially links to other books, so I can browse the iBookstore as I browse a dead-tree bookstore, wandering from section to section, discovering plenty of books I’d never heard of. All that said, the iBookstore offers plenty of books I’m interested in; it’s just a matter of finding them. Now, if you’ll excuse me, I’m going to go re-read Stephen King’s Dark Tower series on my iPad.